Whh do you want to use Raft? Raft is just meant for non-level platforms. the raft helps to get a perfect flat ground. without it depends on your printbed, this is hard to get to level at 1/100mm or better. You often print with a first layer of 0.01? You write 0.1mm layer height for this model. But even if people print with 0.1mm layer height but slightly higher first layer, like 0,13 or something, it's still way more flat and near perfect first layer, than if you print using Raft. Using Raft you get a rough first layer of the real object, as the first layer (above raft) will be put down 0.3mm above the raft by default, which will cause a lot of sagging and not very nice first layer.. You can decrease this all you like, but first layer will still look like dirt compared to just adjust first layer without raft if your printer needs it. I tend to print first layer pretty much the same as all other layers, or at least only tweak it a bit, like 0,21 for 0,2 layers etc. But even if people used 0.2 for first layer for a 0.1 print it would still be better than using Raft. I do like your model though, so it's not like I'm trying to dish the model in itself, only the Raft portion. The 0.01 comes from your comment “..hard to get level at 1/100mm or better”. This equals 0.01mm or better first layer. The photo doesn’t shown the bottom, so can’t see the result of the raft. I Know the purpose of raft and it ain’t filling in small dimples, but if you can get a glass like first layer on top of a Raft I’m impressed and must say I can’t imafine how this is done without the object binding to the raft? I honestly just see it as a waste of time as you can accomplish the same without using raft by tweaking first layer. for example: here a printbed, there is a height range of 0.15mm (comes from the bed and the mechanics). if you create a adaptive raft to elimate the height difference you will end with a bed/raft where all points will be even. the bottom image is darkened to see more details. Can someone tell me where can i find information's about what to fix according my printed object quality? For example, my problem is that small gaps (like letters V3 or ctrlV and the empty lines below V3) are not noticeable. What printing time is average for this print? Do have slightly issue with the walls and overhang. Overhang printing is a bit fast. Maybe I am printing a bit to fast. It's over 28 degrees upstairs now so difficult to cooldown. Always having issues with sharp overhangs. Work in progress. After some fails due retraction issues that have cause filament breaking this is the first success test. It has some issues. I will try to discover if I can improve it without upgrade the ctc ic3 pro b.
I believe that a cooler fan will help but also thing that I need to deal with some vibration reduction as well. it seems your hardware has some issues with sturdiness. try to calibrate your printbed with a micrometre. lowring the printspeed will normally help. Why does it have 2 STL files? They seems pretty much even? the ctrlv_3D_test_v3.stl is for 0.48mm extrusion width. 3D_test_V3_0.4mm.stl is for 0.48mm extrusion width. I was curious too; however, I believe they are for different extruder widths, 0.4mm vs other. So I would recommend if you have a 0.4mm extruder on your printer to use the file labeled 3D_test_V3_0.4mm.stl. Any idea why Simplify 3D is adding this funny little peak on the top of the amphitheater thing? I'm using CR-10 S5, can someone suggest me what I should do to solve the retraction problem? Similar to a few other respondents, I'm getting a small amount of stringing in places, however the outer edge dimensions are just under 93mm even though Cura shows 100x100. The 'spike' is just about 17.6mm high without a real point at the end. Lettering, bridges and gaps all seem reasonable though. Has anyone got an answer to the size issue yet, as it seems a few of us are getting the same dimensional errors? Is it a Cura problem? It's a challenging model for a simple printer, but I can't complain at the results I've regularly achieved from the A8 with virtually no upgrades. Have some stringing going on between the spike and the warp at about half way through the spike. Also have a string going from the Hole 4mm to one of the minimum distance walls. Other than that looks fantastic, any pointers? CR-10 300x300x400 printer, .1 layer height, .8 wall thickness, 1 top/bottom, 215 temp, 30 infill, 95% flow, 4.5 retraction 25mm/s retraction speed, 50 mm/s print speed and 80 mm/s travel. Heads up your file may be scaling somewhere. In Cura 2.6.2 it shows as 100x100x23.5mm in scale. However, when I printed it the outer dims of the octagon are measureing as 92.68x91.83mm. I have checked calibration of the machine and printed a 100mm cube on vase mode and printer gets a 100.1x99.98 cube, well within tolerance for size variation caused by the cheap filament. I then opened the .stl in solidworks and measured the file and it shows the file in solidworks as aproximantly 92.38x92.43 in outer dims. I think your file is bad as solidworks and the print agree on the final dims for your stl. The picture in the package is cropped and doesn't display the full text of what each component represents. I hope you could kindly update that. What I mean is the photo that explains all the 20 tests and what each one is for (you can see it above, its the second one from the left). That one is cropped in the download package and needs to be properly updated. Yes, that works, but online only. However, I'm talking about the downloadable package (the zip file). That image there is cropped and you'd have to come to this page again in the future if you would like to see the full image uncropped. I was hoping the downloadable package is complete and lets you not need to check up things online. That's all. Do you mean .48 / 0.4 layer height or nozzle size? I will try to make this and reply the final results, thank you ! Would it be possible for you to make it for 0.6mm? I printed this on a Wanhao i3 duplicator v2.1 with PLA @ 190C / 0.1mm layers, glass bed. Can you please share your advice on how I can improve my prints? I added images from a few more prints, had 'blobs' on the randomly assigned layer starts on the headphone holder, tried to play with retraction on and aligned the layer start on the hexagonal puzzle box, still not ideal. Thanks! I printed this calibration part some days ago, and globally I am satisfied by the performances of my Prusa i3 mk2 clone printer. The only issue that I would like to discuss, is the text cut-outs, which are filled by PLA, so that it is almost invisible. What kind of parameters should I configure to make this better? I tough about extrusion width? Is that a good idea? What other? Lower the extrusion width of outside perimeters (at least) to 0.42mm - that's the minimum that makes sense for your 0.4mm nozzle. Lower other extrusion widths to 0.45mm. For PLA, print with fan on at 100%, bed at 50-60C. Dry your filament - you're suffering from typical effects of wet filament. It takes very little moisture content in the filament to cause printing problems. Use a vacuum dryer or an oven - 12h at 170F. Usable life of filament in usual humidity above 50% is less than 24h; for high-temp filaments it's even less, e.g. PC is only usable for about 6h unless the printer takes it through a vacuum trap from vacuum storage. My second print on my new printer, also my first printer. Not too shabby of a job for just getting to know my Replicator+. Hey CrltV can you show us the object well printed? Nice test design I will give it a run on my Mircromake 3d Delta with ABS. I know setting with settings in expert mode will make all the difference in how well your printer prints things. Also PETG can be easily print a stringy mess. PETG and most other filaments will print a stringy mess if you don't thoroughly dry it. The only real way of drying filament is in vacuum, look on eBay/Amazon for vacuum drying kits - you can get say 3-5gal dryer with a vacuum pump for <$150 shipped. As an alternative, wrap the spool in aluminum and set at 175F in an oven for 12h. It won't remove all of the moisture, and the hot filament is hard to deal with, plus some of the spools get iffy at that temperature already. Vacuum is so much easier to deal with. KMSD3D, Could you provide a link to a vacuum dryer from ebay? All I see is 3000+ models! Thank you for your time! I like so many before me have attempted this model and I must say I am not entirely sure how I feel about the results. I posted all the details https://www.thingiverse.com/make:319585 including settings. Anyone have some advice on where to begin on tweaking my printer's various settings to make sure all the right knobs and levers get pulled and turned at the right moment? I use a Tevo Tarantula and everything turned out perfect. the spike was pointy dome was like a ball letters and numbers all good. I recommend a Tevo tarantula to everyone. you probably need some fans to make the filament dry a lot faster and probably get a filament spool as well just to help. Almost made it through! Had some issues with the lettering and the "comb" area (spacing test). The spike didn't point either, but everything else was perfect. Ideas on how to improve spacing? How this is "testing" the raft? this test was designed for a specific nozzle diameter? Tks for you reply! Can you make, or tell me how i can make this test for other nozzles? Like .4 or .5? Most things seem ok, except the fins. Only two are separated. But one thing i noticed. everything is 0.4mm too small. The dome/half dome came out really nice! I have pictures on the Things I've Made, but I don't know how to link them here. The "ctrlv_3D_test_v3.stl" is the file intended for 0.48mm extrusion width right? Changes are on the horizon, if you are a fellow maker and having trouble with prints not sticking or coming loose part way through, follow me to keep up to date with my latest research project. your results aren't that bad. from all I can see is the bridge failed, do you have a nozzle fan? Sanity check: the 100mm total width is from corner to corner, right? Because I get closer to 92 side to side, and that's rather a lot to be off. It would be better to scale up to 100 mm side to side, and to rotate the design so that sides are parallel to axes. That way dimensions are easier to check with calipers. Also, correct dimensions for various features should be given in the docs. Otherwise this is a great test object, thanks! Hello, could anyone help me :P I printed it but the results aren't really nice. Biggest Problems are the "Minimum distance + Walls". There is no gap between the walls. The Second Progblem is the Text-cutout. Well, it just looks like crap. The sizes are good, the resolution of the rounded Print isnt the best, but it is okay. Even the overhangs are looking ... okay.. But please take a watch on the pictures -> http://pho.to/AZd05 , I have no Idea what I could change :O Becaus of this reason, I post all the settings below. I printed with a just-built Rostock Max V3 and have some problems. Strange strings on the approach to an object. Fault on the dome wall. I'll try getting the overextrusion fixed first and then move on to those funny strings. Has anyone seen this? I'm pretty happy with the print, but the bridge part is a fail. Just a shame that cura dont have settings for that. try to use a fan for bridges and/or adjust printspeed. it seems the retract could be finetuned. Ooze is the stuff the bridges are build from, kinda. it seems the printer has some hardware issues, the bottom is not even. things are distorted. maybe a little to much plastic. The little rectangles that are standing up, will only print 3. It won't do anymore, using simplify 3d, and a .4 nozzle. Anyway to fix this other than making the print larger? your nozzle diameter defines the minimal wall size. the slicer has also influence. If you need any other information let me know, thanks so much. PLA can be hard to adjust. did you try less but faster retraction distances like 1-3mm? temperature can also be an issue, try to lower in 1°C steps. When I try to slice this in Slic3r with my settings (0.4mm nozzle, 0.48mm extrusion width, as is commonly recommended) it won't generate the support beams for the bridges. I had to scale it up to 150% to get them to generate. Probably just a quirk with slic3r, as even dropping my extrusion width to 0.4mm wouldn't put them in place. It was going to try to print a floating beam! seems like a bug or feature, tried with 1.24 & 1.29 version and got no support until scaled up to 150%. I don't mean supports like support material, I mean the posts that hold up each end of the bridges. It ended up printing pretty well at 150%, but it certainly isn't tuned for a 0.4mm nozzle with Slic3r. None of those points are relevant to my post except for slicer version. 1.2.9. Nice 3D printer test, thank you ctrlV ! If you have suggestions about the results I'd really appreciate! Thank you! with http://craftunique.com/craftware the raft can be peeled of like a sticker. Im using simplify3d and not sure how many raft layers to select? Its currently set at Raft Layers :3, Offset from part: 3mm, Seperation: 0.14, Raft infill: 80%, and an option to check "disable raft base layers" which is unchecked. This look ok to use? Thank you!! 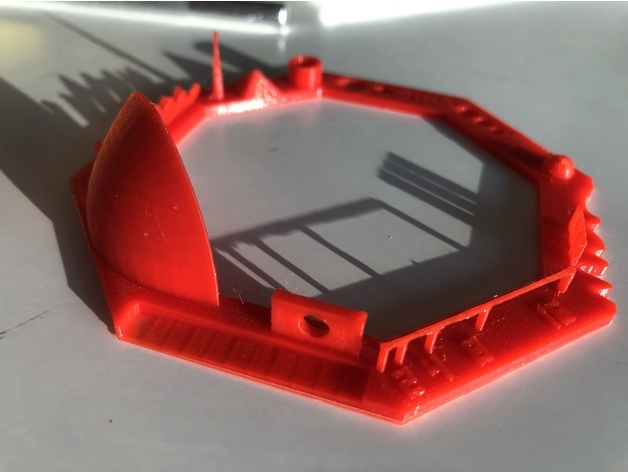 I am near perfection with this print, but wanted to know if anyone had noticed that in the model there are 7 walls between the ball and the distance bridges features, yet when printed, only 3 of the walls actually print. I've noticed this with all my prints and with all the makes I've seen posted here. Can anyone explain this? So what is the maximum nozzle diameter that will print all 7 walls? since the smallest wall is 0.1mm guess what? I'm still fairly new to 3D printing but I have had some fairly decent success in printing things in the past. I've noticed that a lot of times on prints with a large base I'll end up with a lot of bubbles on my first layer and it tends to make the next couple layers above it appear messed up as well but I haven't been able to fix the problem. whenever I print a small test cube I generally don't have any issues with this, only when there is a bit of space. I attempted to print this model but since it was one of the "larger" prints I ended up with bubbles on the first layer that messed up a few of the features of the print. By the time it got to layer 6 it was pretty even on the top but the features like the "V3" and "ctrlV" are still messed up since they are supposed to go through all layers but got messed up on #1. Any suggestions on what I might be able to do to fix this? I've tried changing the temperature and print speed and the z offset but not much luck. did you level your printbed with a dial gauge? I did level my print bed, but I didn't use a dial gauge...not exactly sure what that is lol. I leveled my bed by setting everything to home, using calipers to make sure the x-axis was level, and then disabling stepper motors. After that I would move the extruded nozzle to each corner of the print bed and test how close it was using a piece of paper. I adjusted all 4 corners until there was slight friction when sliding the paper under the nozzle at each corner (in other words the bed is leveled so the nozzle is set to the thickness of a piece of paper above the print bed). The first time I tried printing the file I used a raft but that ended up making it want to fill in the area inside the print for some reason and because it was doing that it made the bubble problem I described in my first post even worse. I'm not exactly sure how the raft is supposed to help with this type of print, I thought the purpose of a raft was to lift the print up a couple layers so it wasn't against the print bed? (I could be wrong but that's my understanding of it's purpose lol). If you think it will help I will make the next print with a raft. As for layer height...I thought with lower later height you get more detailed prints? I'm not exactly sure how much raising the layer height by 0.05mm will "decrease" the detail of the print but I'm guessing that doing so might possibly help with my "bubbling" issue so I'm definitely going to want to try that as well. As for the slicer u suggested, is there any particular reason why you think that one might work better for me than slic3r? I have both slic3r and cura installed right now (but haven't really messed with cura too much except when I wanted to print the millennium falcon and couldn't get it to work on slic3r so I used the default settings from cura since I wasn't exactly sure how to set things up properly at the time), but I don't mind getting an additional slicer as long as I'm able to set up what I need in it. Sorry about such a long response!!!! I'm very interested in knowing all the details about what's going on and learning all I can in order to become as proficient as possible with 3D printing. you are able to go down to 1/100 mm which is needed for building precise models. also check points in the middle/side of the bed. optimally all points should be within 0.01mm. needs also a good flat printbed. a raft can help to get a even printbase. think of it as analog leveling your printbed. with a good raft you have flat base. slic3r does not produce a usable raft for me. for me slic3r did not work out well, i encountered a lot of bugs and crazy printpaths. ctrlV I have been using these models since version 1 keep up the great work. I have tried a few variations of settings but the above has given me the best result so far. Any suggestions, what I am puzzled with is the holes are smaller e.g. 3, 4, 5 are around 2.8, 3.7, 4.8. The base plate outside corner to corner is 100mm but only 1.5mm thick. the layerheigth has no chance to go to 2mm. holes can be difficult for the slicer, do a search for polyhole to get more informations. Any advice for improving overhangs? Mine printed pretty well except that overhang and a little stringing at the top of the pointy tower bit. I have the stock fan on the hot end. I have thought about upgrading or maybe putting a desk fan on the prints, but haven't tried that yet. I did not print with cooling as i havent had a chance to install fan duct. Also all the dimensions seem to be off. I measure about 92mm on build width. The circles all seem to be near .5mm small but perfectly formed. Spike is also short. Any advice for settings changes would be great. hard to see details on the photos. does this happen with other material? I have only tried using PLA. Also if I increase the retraction distance do I need to adjust the retraction speed or any other settings as well to avoid any issues? Also there are a lot of different speed options, would you like me to send screen shots of all the options or are you familiar with the advanced settings in MakerBot Desktop? try to change retract speed to 100-250 mm/s (limited to 100? ), go up in 1mm steps until holes appear. try to fine adjust in 0.1mm steps. it seems the smart extruder has an extra restart distance which is set to 0.1mm, try 0.
you can duplicate the high profile and reduce all extrusion speeds to 50%. Okay, I just reduced each extrusion speed by 50%, changed the extra restart distance to 0, decreased the temperature from 205 to 200, increased the retraction from 1 mm to 2 mm, and increased the retraction speed from 50 mm/s to 100 mm/s (the maximum). I am thinking about printing just a small cube, as opposed to reprinting the quality test over and over again, and making fine adjustments to the retraction based upon that in order to save time and plastic. Once it seems the retraction is at a good setting I will print another quality test. Thanks for the help. I tried to print a cube three times but had issues. It would not extrude at all and would just move around as if it were for maybe 10 seconds or so and then it would start to extrude but it was out of sync with the movement as if it were delayed. So I increased the temperature to 205, no difference. I continued to increase it to 215 and still no difference. I then tried a different smart extruder thinking that maybe the issue was with the actual extruder, but no difference. It seems to move around for a little bit as if it is printing and then the plastic comes out afterward and it continues to drip out for a little bit after I cancel the print. Maybe there is an issue with the speeds and for some reason it can not take in to account the changes I made. Do you think I also need to adjust the travel speeds (as the only speeds I changed previously were the extruding speeds) or maybe there is an issue with the retraction (since it was increased) and it is attempting to retract more which is messing up the print process? sounds like the extruder don't like the speed setting, go back to the original settings. So I changed all the setting back to normal and it is still having issue printing. I will check on it and there will be a glob of plastic on the nozzle and it will be rubbing it back and forth on the platform. Any ideas? can you extrude plastic manually? Can you please tell me how you created the numbers 2-4-8-16 (bridge print)? They are being printed so well on my up! mini. Normally, the up! mini has quite a few problems with printing small letters/numbers. I am new to 3d printing, have had issues with only a few walls, issues with ALL my fittings, and issues printing several objects at the same time. I am looking to print this to test my printer but, if any (or all, but really hope it does not happen) come out wrong, what do you recommend twitching on the settings? I am just looking for some feedback, or tips, to what may solve some issues. if you have any questions please post these infos. Ill post my hardware/software info, will let you know how the test goes after the printer is finished printing a different part. what about the sources, to be able to remix for other diameters than 0.48 ? which diameters you looking for? 0.4 would be cool for me. After that, are we really testing the printer, or the slicer :-) ? you can download the 0.4mm file now. this will test both printer & slicer. Thanks for taking the time to make this handy printer test! Say thanks by giving ctrlV a tip and help them continue to share amazing Things with the Thingiverse community. Test your 3D printer! v3 by ctrlV is licensed under the Creative Commons - Attribution - No Derivatives license.